Telomeres are nucleoproteic structures that cap the end of eukaryotic chromosomes. They are essential for the stability of the genome and are thought to constitute potential targets for cancer therapy. Telomeres are constructed around specialized proteins that bind the telomeric DNA such as the protein TRF2 which plays a vital role in telomere dynamics and protection against illicit recombination or repair. TRF2 also acts as an essential building block of the telomeric architecture through the folding of telomeric DNA into a lasso-like structure called the t-loop. In a recent publication we have uncovered new striking properties for this protein. 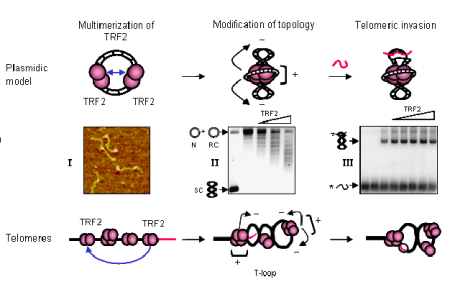 We have observed that TRF2 forms multimeric complexes, where the DNA substrate is wrapped around the protein therefore changing the topological state of the surrounding DNA. We have hypothesized that this multimerization and the change in DNA topology are essential events for the formation of the t-loop structure on telomeres. The aim of our current work is to decipher the biological implications of these new findings in t-loop formation in vivo, telomere elongation in cancer cells and telomere biology as a whole. Mutants of the TRF2 protein impaired in various functions (multimerization, wrapping, DNA binding) are constructed and analyzed for their physical (NMR, X-ray crystallography, SAXS, AFM), biochemical (DNA-protein, protein-protein interactions, DNA topology) and biological (effect on telomere physiology) properties. We also investigate the possibility of affecting telomeric functions in cancer cells through the targeting of TRF2 by using functionalyzed peptides. When TRF2 binds telomeric DNA, it forms multimeric complexes where DNA is wrapped around the protein core (I, Atomic Force Microscopy image of TRF2-DNA complexes). This wrapping leads to the supercoiling of the neighbouring DNA (II, formation of supercoiled topoisomers on a relaxed closed plasmid). This supercoiling stimulates the invasion of a telomeric single stranded probe in the plasmidic target (III, invasion assay showing the increased in the amount of invaded plasmid with TRF2 concentration). In natural telomeres, TRF2 is thought to create a supercoiled DNA loop by forming multimeric complexes and wrapping DNA. This will stimulate the invasion of the telomeric single strand tail in the telomeric duplex. In our model, the t-loop is formed and stabilized by a process driven by protein-protein association and topological modification of DNA. Amiard S, Doudeau M, Pinte S, Poulet A, Lenain C, Faivre-Moskalenko C, Angelov D, Hug N, Vindigni A, Bouvet P, Paoletti J, Gilson E, Giraud-Panis MJ. A topological mechanism for TRF2-enhanced strand invasion. Nat Struct Mol Biol. 2007 Feb ;14(2):147-54.